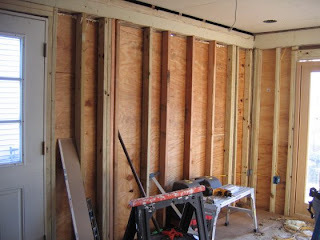 Apparently, I've Been Domesticated: Bruce Springsteen Stole my Contractors! Okay, so he didn't steal them, they left me for him. Apparently he's playing in PA so they're heading down there for a four day weekend. Before they left, they got a quite a bit done. They re-did the wall with the picture windows. I was hesitant to spend the money on it, but it turned out to be money well spent. Apparently, the other guys just nailed the windows in without a frame or flashing strips (?) or anything. So when he pulled them out, an actual stream of water poured out of the channel in the window. Yeeowza. 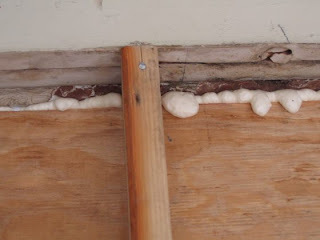 He also used spray foam insulation in any open areas of plywood in lieu of taking down every piece and starting over. 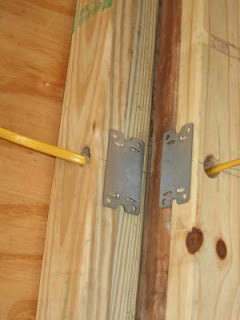 Since the other guys were nail gun happy, there was no easy way to salvage and reuse the original material. The attic ladder is in, obviously he has to finish shimming it. 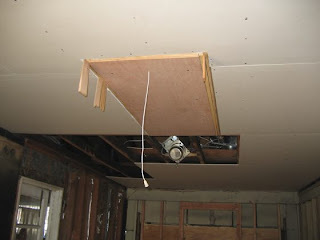 And all the ceiling sheetrock is up except for most of the area next to the wall that's coming down. 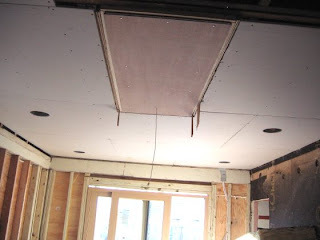 Here's the other side of the ceiling with the recessed lights installed. 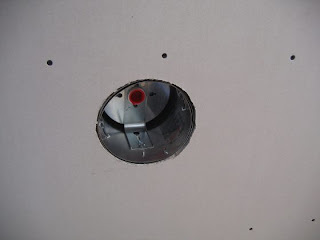 This is how a properly installed recessed light should look. The electric is done, with the exception of some little details. I have outlets galore and we carefully planned out which switch should turn off which lights. That takes way more effort than you think it should. 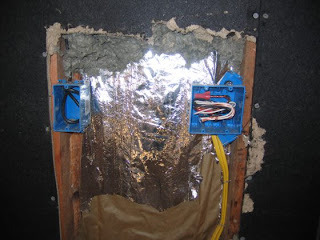 He even installed nail plates over the studs where the wires run through and over the areas the other guys gouged out to prevent me from ever drilling into them and starting a fire. The outside wall is all Tyvek-ed now, so hopefully I can pick up some fanfold insulation and a square or two of siding on Monday.